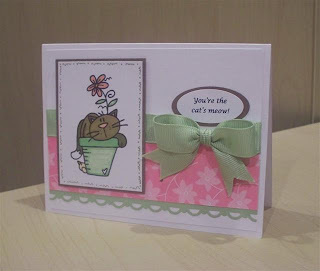 Here's a card I made for Bugaboo Stamp's oldie but goodie Thursday. I simply printed the cat image, heat set it with my heat gun and colored it using my SU markers and then I added some doodling all along my main image panel. What a fun card, cute image and such a perfect sentiment! Glad to see you in blogland! Will add you to my blog list. Precious card, Patty. You do such amazing things with those SU markers. WOW! Patty this is adorable. Your sister will LOVE it! And that bow, well all I can say is SHUT UP! It's PERFECT!! Great card! Love the colors. Love the image and ribbon. Patti, this is sooo cute!!! Love the image and the colors you used. Pretty bow!! !